This chart compares assisted suicide and euthanasia rates in every 10,000 deaths in the first year following legalisation in four separate jurisdictions to the same rate in each jurisdiction in 2015. Once legalised, assisted suicide and euthanasia become a normalised way of dying for an increasing number of people. The two tables below show the growth in numbers of those dying by euthanasia and/or assisted suicide in the Netherlands and the US state of Oregon, from the year their laws passed up to the last year for which reports are available. 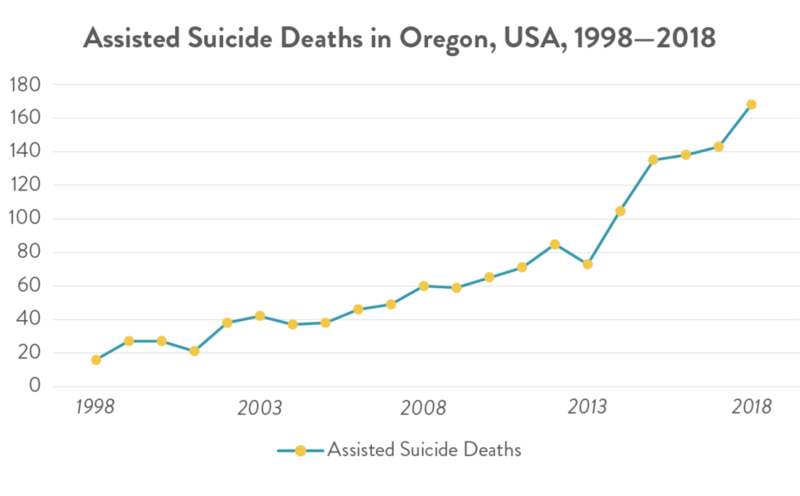 Deaths from assisted suicide and/or euthanasia have increased significantly in the Netherlands and Oregon, but the greatest rate of increase has been in the Flanders region of Belgium. In 2007, the euthanasia deaths accounted for 1.8% of all deaths in the region; by 2013, they accounted for 4.6%. No one knows for certain why assisted suicide and euthanasia deaths increase year after year once legalised. Some say it’s because people become more familiar with the procedures and feel more comfortable asking for them. Others say that medical professionals come to see euthanasia or assisted suicide as a usual course for certain diagnoses and encourage their patients that it may be their preferred option. Others say that, as a society gets used to the idea that assisted suicide or euthanasia are an option, those who are eligible can feel pressure to not be a burden on society and the medical system by saving scarce healthcare resources. Whatever the reasons, euthanasia and assisted suicide may begin as an option for a small number of people, but it doesn’t stay that way for long.